It goes without saying that those certain circumstances are mainly one thing: moderation. Pairing wine with food is the best way to moderate its effects on your body, and still reap the benefits. Recently the Boston University School of Medicine published a critique of scientific studies, concluding that the beneficial effects of wine are more evident if it is consumed with food. Seems like common sense, no? Wine is better for you when you don’t drink on an empty stomach. According to a recent study, having a diet high in flavonoids (powerful antioxidants) from things like red wine, dark chocolate and blueberries is associated with a 10 per cent reduced risk in some circulatory problems. That benefit is doubled for those who exercise as well. The consumption of flavonoids and moderate amounts of wine are similarly known to benefit heart health. You may recall that a year or two ago there was a pretty exciting study showing that some types of red grapes contained compounds that helped burn fat. The headlines were all about drinking wine instead of going to the gym. Unfortunately that compound, ellagic acid, is not found in 99 per cent of red wine grapes, only in a few obscure eastern European varieties. Harvard Medical School points out that the reservatrol in red wine also activates genes which protect against ageing in general! A 29-year study of men that followed them from their 40s right through to their 70s showed that the moderate wine drinkers had a 34 per cent lower total mortality than those who drank moderate amounts of beer or spirits. The difference was due mainly to reduced risk for heart disease. A series of studies of over 300,000 people suggests a 30 per cent reduced risk of type 2 diabetes in moderate alcohol consumers, compared with those who don’t drink. Yay! Reservatrol, found in red wine, can protect against the damaging effects of high blood glucose, according to a 2013 study. A study by staff at UC San Diego found that modest wine consumption (*one glass per day, red or white) is associated with a halving in the prevalence of the most common form of liver disease. A key to marital bliss? Couples who share a drink together report less marital difficulties over time, compared to couples where only one partner drinks, according to a recent study by the University of Michigan. The quest for more reasons to enjoy a great glass of wine continues. Although, really, who need more reasons? Is wine good for you? The answer looks to be a resounding yes – in moderation, and if it is enjoyed with food, and even better, with others. Luckily, there are so many other reasons wine is great – it is endlessly fascinating, complex, delicious, can make a good meal great, and generally makes you happy! So, go forth and be healthy: develop your wine wisdom in moderation (for healthy men and women, drinking no more than two standard drinks per day, according to the NHMRC). 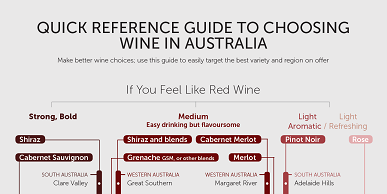 You can download the guide to buying wine, below, to get started with your wine wisdom.